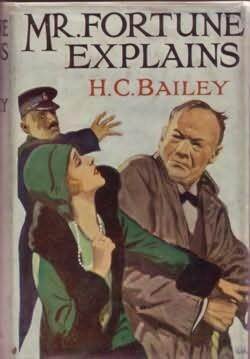 Mr Fortune Explains is a 1930 short story collection from the pen of H.C. Bailey and featuring Reginald Fortune, a kind of scientific and medical advisor to Scotland Yard. The Reggie Fortune stories were immensely popular in their day and have since fallen into almost total obscurity. These stories are very entertaining and Reggie Fortune is an amusing and rather likeable eccentric genius detective. The weakness of these stories is that they’re not remotely fair play. Most of Mr Fortune’s cases seem trivial and routine at first and the authorities are usually all that interested. Reggie Fortune however knows that the cases are not straightforward at all. Terrible crimes are being committed (or at least planned) and no-one would care or even suspect were it not for the fact that Mr Fortune has seized on some vital piece of evidence that leads to the uncovering of a frightful conspiracy. It’s not a bad formula but the problem is that it relies entirely on some extraordinary leap of intuition on the part of Mr Fortune. Even when the solution is explained the chain of reasoning that led Reggie Fortune to the explanation of the puzzle is just not there. We’re left to believe that he must have relied on divine inspiration or that he has some supernatural or paranormal powers of perception that are denied to mere mortals, such as the readers of these tales. The first story in this collection, The Picnic, is a good example. The brother of a nobleman is the victim of a violent assault. From this Mr Fortune is not only able to deduce the existence of a conspiracy to kidnap a young heir but can fill in just about all the details of the elaborate plot. The second story, The Little Milliner, involves a missing shop girl. She has most likely run off with a gentleman. What little evidence there is points in that direction. Mr Fortune however knows that the young shop girl has been the victim of a terrible conspiracy. The shop girl’s story is clever enough but again Mr Fortune appears to solve the puzzle by means of lucky guesswork or pure intuition. The Wedding Ring is delightfully convoluted. There’s a doctor who needs to consult Mr Fortune urgently but the doctor disappears. Later his wife disappears. Someone tries to murder Reggie Fortune. It may have something to do with industrial espionage. There are all sorts of people who aren’t what they seem to be. It’s all thoroughly enjoyable. In The Football Photograph Reggie is involved in investigating a smash-and-grab raid on a jewellery store. This is nicely complicated police procedural sort of stuff with some obscure but amusing clues. This is also Reggie Fortune at his most devious, laying an elaborate and clever trap for a murderer. An excellent story. The Rock Garden takes Mr Fortune into the countryside. He’s been invited to see the rock garden belonging to a Mr Briggs and he’s fairly confident that Briggs does not possess a rock garden. This interests Mr Fortune enough to convince him to accept the invitation. It turns out there are other mysteries besides the rick garden, like the missing window in the library, and those rapping sounds that only Briggs seems to hear. This is a nice little mystery with its roots in the distant past. The Silver Cross is a clue in what seems like a fairly trivial robbery. The chief suspect is a man of the cloth but the silver cross is not a Christian cross even though it implicates the clergyman. The problem with the cross as Reggie Fortune sees it is that it makes the police case both too easy and too difficult. He’s very unhappy about it. The clergyman meanwhile is causing all sorts of difficulties - he is obviously hiding something but he is a remarkably stubborn man. There’s also the question of the local squire’s extraordinary hostility to the Reverend Neath, and the squire’s daughter’s odd behaviour. Not to mention some worrying medical evidence. This tale is a fine example of Reggie Fortune’s ability to turn a very minor case into a very major case by continually worrying about a problem. Another good story. In The Bicycle Lamp a village policeman is knocked down by a car and killed. A tragic accident but the police doctor is perfectly satisfied as is the Chief Constable. And that’s where the matter would have rested had it not been for the fact that Mr Fortune and his friend Mr Justice Platt not been the first on the scene. To Reggie the evidence is quite satisfactory except that it’s obvious that no such accident occurred at the spot where the body was found. Reggie is accused of theorising and he is most indignant, insisting that he is merely following where the evidence leads. The trouble is that sometimes the evidence leads to unpleasant conclusions. In this case Mr Fortune has to deal with the official mind and the official mind in this case seems to be either notably lacking in zeal or infected with disturbingly excessive zeal. It’s a case that just gets out of control. Bailey often seems like an author with more interest in the moral side of crime than in the simple solving of puzzles. Mr Fortune is by and large a loyal servant of the inexorable forces of law and order but it’s something that on occasions causes him a good deal of distress. The law can be a distressingly blunt instrument. The Face in the Picture takes Bailey’s method to an extreme. Reggie Fortune is in Paris and sees two paintings at the Salon, both by the same artist. There’s something very wrong with one of the paintings. Or perhaps it’s the other painting that’s wrong. Or perhaps they’re both wrong. One thing Mr Fortune is sure of - there’s definite wrongness here. It is fortunate that his friend M. Dubois of the Sûreté is used to Reggie’s instincts. And of course once it becomes obvious that there’s a lady involved, then M. Dubois is most anxious to help. A crime has been committed, although the nature of the crime is by no means obvious. The extraordinary thinness of the clue (if you could even go so far as to call it a clue) that puts Reggie on the trail of a desperate criminal should be a fatal weakness but Bailey, like Reggie Fortune, has such boundless confidence in his instincts that he just about makes this story work. Not quite, but one still has to admire the daring of the attempt. Some readers will be entranced by both Mr Fortune himself and the stories in this collection. Others will be exasperated. Personally I find both the stories and Reggie both entrancing and exasperating in equal measure but at least they’re never dull. Mr Fortune is an acquired taste but be warned - he can be addictive. Mr Fortune Explains is recommended. 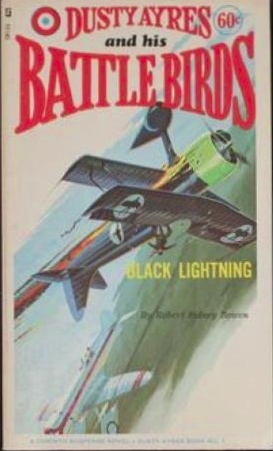 American pulp writer Robert Sidney Bowen (1900-1977) had served with the British Royal Air Force in the First World War. He worked as an aviation journalist and in the 30s he turned to pulp fiction. 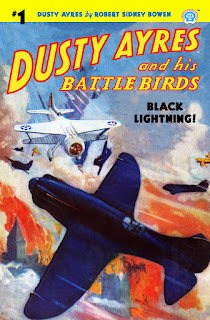 His first successful creation was Dusty Ayres who featured in the short-lived Popular Publications pulp magazine Dusty Ayres And His Battle Birds. 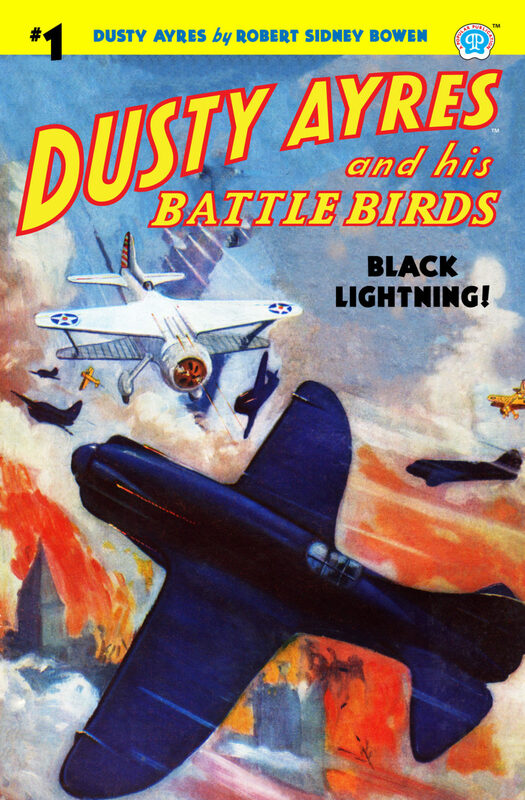 Black Lightning is the first novel length instalment in the Dusty Ayres saga. Captain Dusty Ayres in a U.S. Air Force pilot in a crack High Speed squadron. He flies the Silver Flash, a highly advanced high speed pursuit fighter which is the only one of its kind. And now war has finally arrived. The fearsome barbarian hordes, the so-called Black Invaders, have overrun Asia and are now completing their conquest of Europe. Only the United States now remains to defy their power! The Black Invaders are led by the self-styled Emperor of the World, the mysterious man known only as Fire-Eyes. Dusty Ayres is given a vital mission by X34, the Intelligence chief in Washington. The only safe and secure way to get urgent mobilisation orders to the various area commanders of U.S. forces is by delivering the orders by hand. That’s Dusty’s job. It proves to be far more difficult than expected. The invaders have been so successful in sweeping through Europe because they undermine their enemies before attacking them, with huge numbers of spies and saboteurs and secret agents preparing the way. These secret agents have already been infiltrated into the United States. In fact the subversive activities on American soil have been on a vast scale, with entire secret underground bases established. High-powered transmitters have been emplaced which will be used to jam all radio communications and paralyse the American defences. And trying to prevent Ayres from carrying out his mission is the most deadly pilot in the Black Invaders aerial forces, the dreaded Black Hawk. This first novel in the series is rather vague about the origins of the Black Invaders. Given that they have come out of Central Asia they are presumably a kind of modern version of Genghis Khan’s Mongol hordes, but with very high-tech weaponry. So this is essentially a Yellow Peril tale. It also belongs to the Future War genre, a genre that first emerged at the end of the 19th century. And of course it also belongs to yet another pulp genre, the aviation adventure genre, and it qualifies as science fiction as well. It has pretty much every pulp base covered. Dusty Ayres is your typical square-jawed Yankee action hero, insanely brave and with unquenchable determination. In this first adventure there are perhaps some slight doubts about his judgment although in his defence it has to be said that he’s put in situations where he has to make split-second decisions based on very incomplete information. Fire-Eyes is obviously the chief villain, a cross between Genghis Khan and Dr Fu Manchu, but he’s a shadowy figure. Black Hawk is the villain we see most of and he’s more than just a crack pilot - he’s the commander of the air forces of the Black Invaders and clearly is very high up in the Black Invaders hierarchy. It’s interesting that despite the central Asian origins of his barbarian horde the author is not very interested in the race issue. In fact it’s hardly mentioned. The villainy of the Black Invaders seems to be mainly due to the fact that they’re not American and they don’t believe in democracy. In fact the author may have been more intent on telling a Red Peril tale (the evils of Bolshevism) rather than a Yellow Peril tale. Having said all that you’ll be relieved to know that the book still manages to be fairly politically incorrect. Dusty Ayres is initially a solitary hero but Black Lightning introduces a figure who will apparently be a crucial ally to him in subsequent instalments. The style is exactly what you expect from the pulps, full of breathless excitement and generously laced with action and thrills. If air combat adventure combined with weird fiction and/or science fiction elements is a cocktail that appeals to you then the pulp writer you need to seek out is Donald E. Keyhoe (Strange War, the Richard Knight stories, etc). He did that sort of thing better than anyone. But Black Lightning is still a good deal of fun and the Dusty Ayres series seems to have definite promise. Recommended. John George Hazlette Vahey (1881-1938) was a prolific Belfast-born writer who penned twenty-two mystery novels under his own name between 1928 and his untimely death in 1938. He also wrote many titles under a variety of pseudonyms. He has languished in obscurity since his death although in the past few years he has started to attract some favourable critical attention. The Mystery at Stowe was the first of the detective novels published under the Vernon Loder pseudonym. It was re-issued by Collins Crime Club a couple of years ago and is, sadly, the only Vernon Loder novel that is readily obtainable (although I believe at least one other title is forthcoming from Collins Crime Club). The Mystery at Stowe is on the surface very much a stock-standard country house murder mystery. Mr Barley is a reasonably wealthy and quite respectable sort of fellow who owns the old manor house at Stowe. He has a full complement of house guests. There is some tension. Elaine Gurdon is a beautiful and rather glamorous explorer who is currently planning yet another expedition to the depths of the Amazon rainforest or something similar. Her expedition is being partly financed by Ned Tollard. Ned and his wife Margery are also among the house guests. Ned Tollard’s lavish financial backing of Elaine’s explorations has raised some eyebrows and Margery Tollard has taken on the air of a tragic wronged wife. The real problem seems to be that Margery likes artistic things and artistic people while her husband is more from the huntin’ shootin’ and fishin’ school. It’s not hard to imagine that he might prefer the adventurous Elaine Gurdon to his languid and overly arty wife. Of course there is a murder. And the murder weapon is a blow-gun from Patagonia or some outlandish place like that. In fact the murder weapon would appear to be a blow-gun that was sold by Elaine Gurdon to Mr Barley. And of course, in the finest murder mystery tradition the poison is suspected to be curare, as used by Amazonian tribesmen and occasionally be English murderers. Except that, as Elaine points out, it can’t be curare. There’s a problem with the freshness of the poison. While there were a dozen or so people at Stowe House at the time of the murder it soon becomes clear that suspicions are going to be focused on just two people, these being the only ones with any kind of motive. It takes a while for the hero detective to arrive on the scene but when Jim Carton does put in an appearance he proves to be reasonably interesting. He’a a young man who has spent several years in Africa as an Assistant District Commissioner, a job which involves quite a bit of detective work, albeit in very different surroundings compared to the quiet English countryside. He’s an amateur detective but with semi-professional qualifications. Superintendent Fisher is not inclined to take him seriously until the young man spots a very vital clue that the superintendent had missed entirely. After that the superintendent is much more tolerant of Jim’s detective activities. Jim is not your cool dispassionate detective who is able to treat crime as an amusing parlour game. He happens to be head-over-heels in love with one of the chief suspects. He’s not even remotely unbiased. In an official police detective his approach would be disgracefully unprofessional but of course he’s doing his sleuthing purely on a private basis. And while his emotional involvement may well be leading him badly astray he’s also in his own way a very astute detective so he may well solve the case anyway. I believe this was Jim Carton’s only appearance in Loder’s books. It’s a pity but then the emotionally very involved detective is probably not a trick you’re going to be able to pull off twice with the same character. This is also a story with a suspect who is remarkably difficult to help. A suspect who seems quite incapable of realising the extreme danger of their position. The rather fraught and complicated relationship between detective and suspect (complicated by the fact that she may or my not be romantically involved with another man) is as much the focus of the story as the actual puzzle, but the puzzle is still there and it’s fairly effective. On the whole this is a thoroughly entertaining novel which takes itself just seriously enough to keep it interesting. Loder treats the whole poison dart thing exhaustively as Jim Carton comes up with an extraordinary array of theories as to how it could have been done. There are three things that might turn some readers off. Firstly there’s the emphasis on Jim Carton’s desperate love for Elaine Gurdon. Secondly there’s the fact that his entire investigation is based on his central theory that Elaine must be innocent because he loves her. Thirdly there’s the solution which involves one of those plot elements that tends to enrage certain vintage detective story fans. Personally I thought there was enough energy and enthusiasm to compensate for any minor defects. And as for that controversial plot element, if you’re going to use such a device at least use it skilfully, and Loder uses it very skilfully indeed. This is a book that seems to produce sharply divided opinions among the golden age detective fiction cognoscenti. John Norris’s glowing review persuaded me to buy this book, but Tomcat’s review of it was considerably less favourable. With some minor caveats I’m prepared to highly recommended The Mystery at Stowe. The Case of the Six Coffins was the first of the seven pulp novels written by Robert J. Hogan in 1935 and 1936 and published in the pulp magazine Mysterious Wu Fang. Robert J. Hogan (1897-1963) was an American pulp writer who specialised in aviation adventure tales (such as the Smoke Wade stories). Mysterious Wu Fang seems to have been his only foray into the Yellow Peril genre. The story opens with mass murder on a modest scale, and with hints that this is just the beginning. Wu Fang is responsible but it is obviously just a part of a much larger plan. It has something to do with a small bottle of colourless liquid and a torn note. Ace reporter Jerry Hazard is aboard the SS Bergenland en route for New York when he strikes up a friendship with Val Kildare. Kildare is a Federal agent and for several years now he has been devoting himself to the pursuit of the world’s most dangerous man, Wu Fang. Also aboard the ship is a stunningly beautiful girl. Jerry Hazard has lost his head over her already. It soon becomes apparent that while Val Kildare thought he was hunting Wu Fang at the moment it’s very much the situation that Wu Fang is hunting Kildare. And he’s hunting Jerry Hazard as well. There’s also a Scotland Yard man on board but he’s just another hunted animal in this game. Wu Fang is aboard the ship and he has a plentiful supply of his killers on hand. Some of his killers are human. Most are not. Most are animals but they’re not animals that exist in the natural world. They are fiendish freakish creatures that have been bred not just to kill, but to kill in as terrifying a manner as possible. This is partly to gratify Wu Fang’s taste for cruelty but it’s also a matter of policy. Terror is a very useful weapon to Wu Fang. I’m exceptionally fond of mysteries and thriller with shipboard settings. And The Case of the Six Coffins makes extremely good use of this setting. Wu Fang certainly does have a plan and he has a deadly super-weapon. The lives of millions are at stake. Wu Fang has no scruples about killing a few million innocent bystanders. The events on board the ocean liner seem to be moving towards a thrilling action climax and that’s what we get but the story is far from over. And there is plenty of action still to come. Val Kildare is a straightforward square-jawed hero. As a hero he certainly gets the job done. Jerry Hazard is a shrewd and gutsy reporter and he makes a useful sidekick. Wu Fang is of course yet another Dr Fu Manchu clone. He lacks the complexity of Fu Manchu, and the surprising touches of honour and even sportsmanship. Wu Fang is just a straightforward monster. He’s your standard diabolical criminal mastermind. It has to be said though that he is an effectively frightening villain and for much of the story it’s Wu Fang who seems to hold all the high cards. Compared to Sax Rohmer’s Dr Fu Manchu stories this is just a lurid pulp thriller. Rohmer’s stories involve a fascinating clash between civilisations with the West having the edge in some areas and the East being ahead in other ways. This gives the stories something of an epic quality. Wu Fang just wants power. He’s a lot less interesting. On the other hand, as lurid pulp thrillers go, this one has plenty of high-octane excitement and it has pleasingly breakneck pacing and it has some genuine scares. 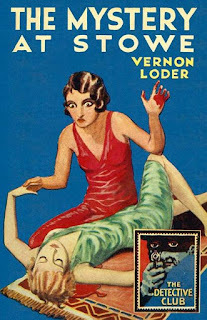 Being aimed at the pulp market it’s a lot more gruesome than Sax Rohmer’s tales and it has much more pronounced horror elements. Hogan’s prose is basic but it works. You might be wondering - is it politically correct? The answer to that is simple. No, it ain’t. Some pulp writers transcended their pulp backgrounds and created woks of surprising power and subtlety. Robert J. Hogan was not one of those writers, and he probably didn’t care (and there’s no reason why he should have cared). 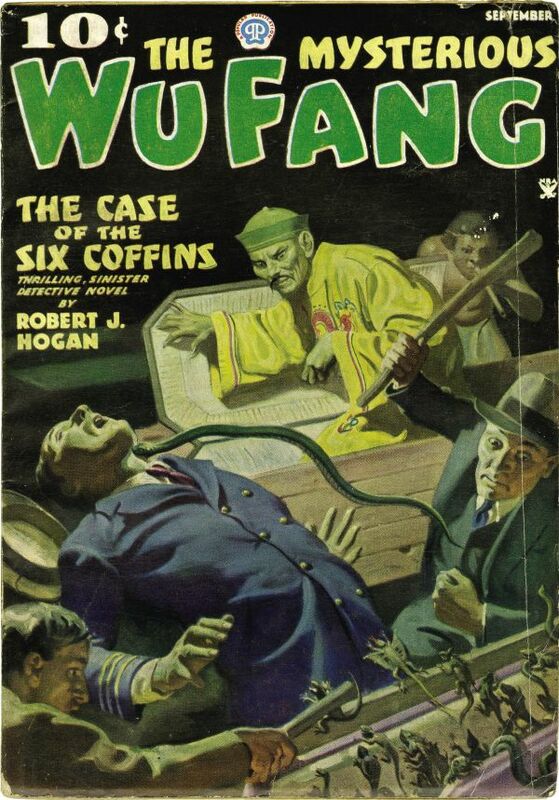 The Case of the Six Coffins is just pure unsophisticated pulp fiction fun. Highly recommended. All seven Mysterious Wu Fang novels have been issued in paperback by Altus Press and they’re readily available. 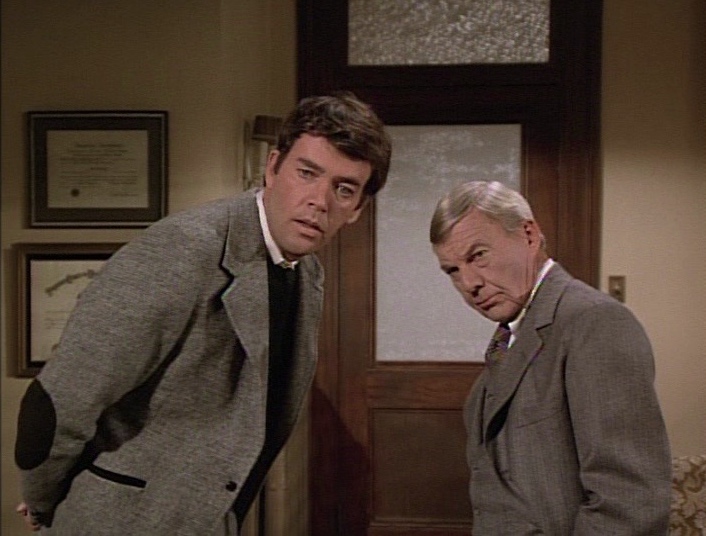 The 1975-76 Ellery Queen series, which starred Jim Hutton as Ellery and David Wayne as his father Inspector Richard Queen, was for my money one of the best ever television series based on the works of the masters of the golden age of detective fiction. I’ve recently rewatched a few episodes and my thoughts on these can be found on my Cult TV Lounge blog. Here’s the link to my reviews of three classic episodes. Black Orchids is one of Rex Stout’s early Nero Wolfe novellas. The novellas came about when Stout discovered a lucrative slick magazine market for short format mysteries. He could churn them out quickly and they could later be collected two, three or four to a volume in book form. The book publication versions were usually slightly longer than the magazine versions. Between 1940 and 1963 Stout wrote forty-one Wolfe novellas. Black Orchids was the longest of them. It appeared in The American Magazine in 1941 and in book form (paired with Cordially Invited to Meet Death) in 1942. Archie Goodwin is not an overly happy man at the beginning of the story. He knew that Wolfe would expect him to go to the flower show but he hadn’t anticipated having to spend four consecutive days there. There is some consolation though - one of the exhibits features a rustic tableau that includes a rather pretty female. An actual human female. Archie has nothing against flowers but his interest in human females is considerably more keen. The reason he has to be there for four days is a simple one. A rival orchid fancier has three black orchids on display. Nero Wolfe is consumed by curiosity and by envy. In fact it gets so bad that Wolfe breaks his number one rule. He leaves the house. He has to see those black orchids. He and Archie see more than orchids. They see murder. In fact everyone at the flower show sees the murder but seeing a murder and actually seeing a murder are two different things (which becomes obvious when you read the story). Finding out who killed Harry is easy but that doesn’t solve the murder (which also becomes obvious when you read the story). Obviously a novella is going to have plotting on the same complex scale as a novel. And there are those (including some of his biggest fans) who maintain that you don’t read Rex Stout for his plotting anyway. There may be something in that although personally I’ve generally found Stout’s plots to be quite satisfactory. Black Orchids in fact has a pretty nifty little plot. What no-one will deny is that the biggest attraction of the Nero Wolfe stories is that they feature two of the most engaging and fascinating characters in all of detective fiction. Nero Wolfe is not just an eccentric. He is a bizarre exotic. Everything about him is on the grand scale - his waistline, his passion for orchids, his deductive genius, his greed and his childishness. In spite of all this the reader never feels tempted to despise him or to dislike him. Nero Wolfe is Nero Wolfe and if you accept him as such you grow to love him. Archie Goodwin is his chief assistant and his Dr Watson. Wolfe is aristocratic in temperament and tastes, highly educated and fastidious. Archie’s education was gained on the streets but he’s shrewd and perceptive. The interplay between these two is always a delight. They’re both in good form in Black Orchids. We get to see the best and the worst of Wolfe’s character, with a breathtaking example of Wolfe’s avarice, and his petulant childish envy. One thing that really struck me was the interesting similarities to the Perry Mason stories of Erle Stanley Gardner. Both Perry Mason and Nero Wolfe are suspicious of authority, and for very similar reasons. It’s not that the police or the D.A. are necessarily crooks. On the whole in the Perry Mason and Nero Wolfe stories the police are essentially honest. But the balance of power lies too strongly in favour of the police and the D.A. and they rely to a large extent on intimidating or misleading witnesses and suspects into saying things that legally they don’t have to. The danger is not corrupt cops - it’s over-zealous cops and District Attorneys. Both Perry Mason and Nero Wolfe know that it’s very often wise to keep witnesses away from the police. For Perry Mason this is not all that difficult. Being a lawyer has its advantages. For Nero Wolfe it’s more risky, private investigators have some legal privileges but not many, but Wolfe knows the law pretty well and he has money and contacts and the police know that he is prepared to get lawyered up if he needs to. It’s not that Mason or Wolfe are lacking in respect for law and order, they’re both quite happy to see the guilty punished, it’s just that they have a lot more respect for the rights of witnesses and suspects. And of course in both cases the motivation is partly idealistic and partly self-serving. They put their own clients’ interests first, although they would argue that it is an essential part of a healthy criminal justice system that lawyers and private investigators should do this. Wolfe gives the impression of being motivated entirely by money but it’s fairly clear that he genuinely dislikes official bullying. It’s interesting that both Mason and Wolfe are quite openly avaricious. In both cases it acts as a useful safeguard against self-righteousness. 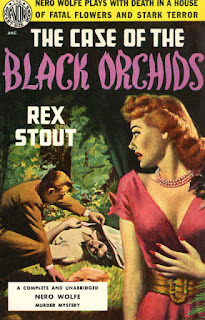 Black Orchids serves as a pretty good illustration of Wolfe’s approach to the duties of a private investigator. The key is to tell the police as little as possible. He ends up with several key witnesses stashed away in his own house so that the cops can’t find them. A private investigator acts in his client’s interests which does not necessarily involve solving crimes and delivering the guilty to punishment. That’s the job of the police. If acting in the client’s interests means identifying the guilty than that’s fine (and almost invariably Wolfe’s cases do require him to do this because otherwise there wouldn’t really be a mystery story). Wolfe doesn’t lie to the police (that would be foolish) but he tells them only what suits him for them to know, and he doesn’t actively obstruct police investigations (although he may do so passively). Black Orchids is also a good example of Wolfe’s methods of dealing with witnesses. Information has to be extracted from witnesses. He can’t use all the methods available to the police but he can use all kinds of psychological manipulation, he can threaten to turn them over to the cops if they don’t tell him what he wants to know, he can mislead them and tempt them and cajole them. Maybe its not much more honourable that the methods used but the cops but we get the impression that Stout sees these methods as being more dangerous when used by the police with the powers of the state behind them. It’s mostly the complete absence of self-righteousness on the part of Nero Wolfe (and Archie Goodwin too) that makes the Wolfe stories so appealing. He’s not an anti-hero but he is an unheroic hero. It’s his unheroic nature that, oddly enough, makes him a hero. Black Orchids is splendid entertainment. Highly recommended.